Until the formation of The Resonance Ensemble in 2007, Ken Vandermark's writing for large ensembles had been limited to his electro-acoustic Territory Band and Peter Brötzmann's sprawling free jazz Chicago Tentet. With this 10-man group, he succeeds in what he works so very hard at with the Vandermark 5. Like V5, his working band, he is able to integrate his passion for collaboration and orchestration with an individual musician's voice. Formed in Krakow for a jazz series at Alchemia, Vandermark's The Resonance Ensemble draws from an international pool of musicians. 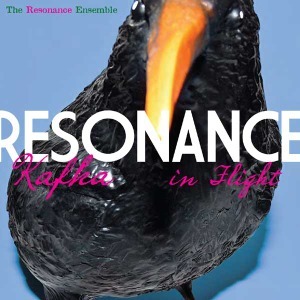 Like the ensemble's previous recordingsResonance (Not Two, 2008), and the two discs from the massive, 10-CD Resonance (Not Two, 2009) box, Kafka in Flight is a live set, recorded in Gdańsk, at the Philharmonic Hall. The sound is clear and crisp, with Vandermark's writing and orchestration also doing service to the sound. He is never one to clutter or bunch players for the purpose of power and noise. The three lengthy tracks heard here state themes, break into smaller modules that he can stack and rearrange as the music is being presented. Although something like Count Basie's "April In Paris" shouldn't be expected from Vandermark, there also isn't the mishmash (which is fantastic live, but sometimes doesn't translate well to recordings) that can be found in Brötzmann's Tentet. The ensemble is quite efficient beginning as a New Orleans brass band on "Rope" with bit of funk and heavy overcoats, only to break into almost silent duet from trombonist Steve Swell's trombone and tubaist Per-Åke Holmlander. Vandermark colors the music, brushing swells and paired notes here and there, but allowing for multiple players to solo freely in improvised sections through separation of parts and themes. The artistry here is his ability to keep all these chunks and slices of sound together in a consistent message. Track Listing: The Pier (for Yutaka Takanashi); Rope (for Don Ellis); Coal Marker (for Chris Marker). Personnel: Magnus Broo: trumpet; Michael Zerang: drums; Ken Vandermark: tenor saxophone, Bb clarinet; Mikolaj Trzaska: alto saxophone, bass clarinet; Mark Tokar: double bass; Dave Rempis: alto saxophone, tenor saxophone; Steve Swell: trombone; Per-Åke Holmlander: tuba; Tim Daisy: drums; Waclaw Zimpel: Bb clarinet bass clarinet, tarogato.